The best pellet pistol will be a balance of ease of use, intuitive controls, solid velocity and accuracy; as well as top quality materials and construction. 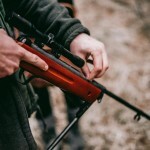 These guns on this list are all suitable for beginners, and there are a few that are purpose built for competitions, hunting or longer-range use. They are of course, more expensive. 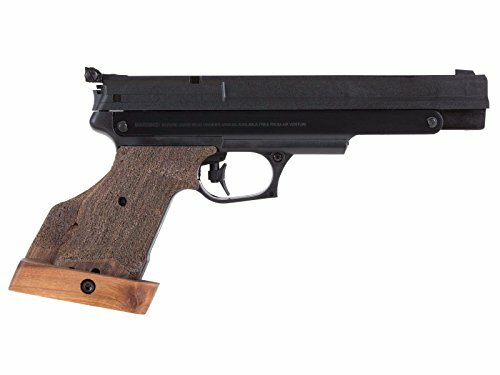 With pellet pistols, it is entirely possible to have an enjoyable experience on the lower end of the budget, but you must understand what you are getting. Hence the reason for this list. Within this list, you will have a varied, strategically chosen list of 12 pellet pistols, all of which have some redeeming qualities. All of which are at different price points. There is a nice mix of entry level, intermediate and high end, with most of the guns being under $100. It is our hope that with the information provided in this article and the basic review information, that you will be able to find the perfect pellet pistol for you needs. Whether it’s the best BB gun for plinking, or a tried and true competition pistol, we have a good breadth of pistols covered on this list and we think the accompanying information will more than prepare you to make an informed decision. Aesthetics are important, after all you’ll be shooting the pistol often. You’ll want something you are happy with. Brand credibility and quality will also be important. You want to know that the gun will last and have service available if needed. You will also want to determine which type or pellet or BB you intend to use from a size and type perspective and choose an applicable gun, so you can achieve the results you desire. .177 and .22 are the most popular calibers in air-pistols, and they are the only calibers we wrote about in this article. The .22 will be more lethal for hunting purposes within reason, and the .177 will be faster, generally speaking. These are not guarantees but they are good general rules of thumb. Do you need accessories to be able to function the pistol? Do you need magazines, revolver cylinders, or cartridges of some type to be able to actually use the gun? Make sure you are performing your due diligence to determine the needs before you buy. The rate at which a projectile comes out of the barrel is an important consideration in many things. From a hunting perspective it will determine what type of animals you can safely kill, and how far away you are going to need to be, to accurately, safely dispatch the animal. From a safety perspective, most pellets don’t travel at a fast-enough rate or possess the requisite material composition to penetrate hard surfaces like plywood or a tree trunk. These surfaces can cause very dangerous redirection of the projectile back at the shooter or at others nearby. The slower velocity guns are more prone to this concern, but all air pistols can be subject to ricochet or deflection so be aware of what you are shooting at and utilize best practices for safety. When it comes to target and competition, velocity can be impactful. The higher the velocity, generally, the flatter the shooting trajectory and the longer the distance you can shoot at and expect consistent and predictable accuracy. The best of the best for high end pellet pistols will have enough velocity to shoot, hunt and hit targets at intermediate distances with no trouble. The cheaper, more poorly made air pistols will generally have dramatic trajectory concerns and inconsistent performance. It is important to understand how to achieve repeatable velocities and to get practice with your pellet gun before you need to count on it in any real way. This is quite straightforward – generally the majority of pellet pistols are utilizing either CO2 or pneumatic air pressure through a hand driven pump or reservoir of some type. For the purposes of this article and the guns on this list, these will suffice, though there are other power delivery methods on the market. CO2 cartridges will be easier to use, faster from an implementation perspective and very consistent without having to try very hard. They are also more expensive and have finite limitations. Hand pumping or hand driven reservoirs are cheaper and longer lasting, but require better planning, more focus and greater understanding to implement. There is no way to determine which choice is better in this article for your needs, until you weigh all the information in this article against your personal proposed use case. Generally, the range for the pellet pistols in this article will cap out at about 50 yards for effective range, and 50 feet for accuracy. These may seem somewhat anemic, and they are when compared to large, high powered live ammunition/firearms. They are however quite respectable and well within reason for the type of scope this article covers. CO2 will generally have less range but be more consistent in accuracy within that range as the cartridge delivery allows for more regulation of power used. Hand pumping or hand driven mechanisms will tend to have a higher upper limited on range achievable, but they are less consistent than CO2 cartridges. Competition single stroke pneumatics are very consistent in velocity and usually have the benefits from both types of delivery in a single system. These estimates are not hard and fast rules and many pellets can travel further than that both with accuracy, and with lethality, so you must understand your particular use case and gun before you can make an educated determination as to the capability of the distances achievable for your gun. 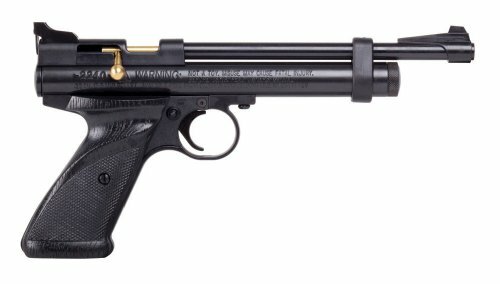 A surprisingly high-quality air pistol, that won’t be mistaken by anyone “in the know” as a real firearm. The Crosman 2240 Bolt Action CO2 Pellet Pistol (0.22) is a single shot pistol that emphasizes focus, accuracy and safety and still offers a legitimately fun experience while shooting. This gun shoots a .22 pellet. 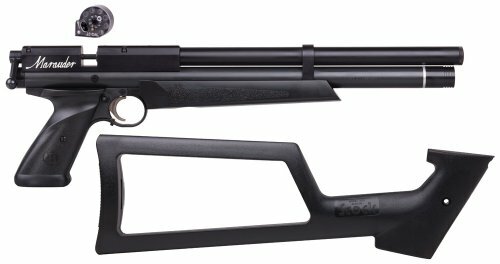 Why it’s recommended: The Crosman 2240 Bolt Action CO2 Pellet Pistol (0.22) is a great gun to plink and shoot targets with, it’s not a dedicated hunting gun, but it knows exactly what its capabilities are and it’s very good at those things. Cheap price point, quality build great heritage. A quality, reliable revolver style pellet pistol that can also shoot BB’s this is a relatively well-made gun with a good reputation and comes as part of a nice kit. The accuracy is good, despite having a relatively low FPS velocity. 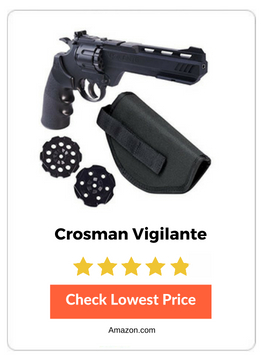 The Crosman Vigilante 357 Co2 Air Pistol Kit gun shoots a .177 pellet. Why it’s recommended: A versatile gun with a lot of potential, this pellet pistol comes as part of a nice set with accessories and add-ons. The quality build and better than average accuracy makes the Crosman Vigilante 357 Co2 Air Pistol Kit a nicely balanced pellet/BB gun. The Beretta PX4 Storm .177 Caliber Steel BB Airgun Pistol is well made and built to resemble an existing member of the Beretta family of firearms. This is a nice homage and has decent accuracy and a nice size, combined with great ergonomics and a balanced feel. The lower velocity makes this strictly a close-range plinking and target shooting pellet pistol. This pellet pistol shoots a .177 pellet. 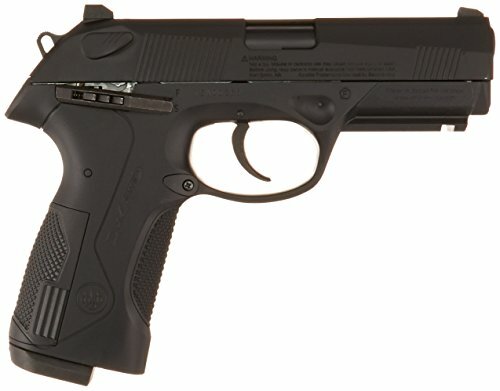 Why it’s recommended: The Beretta PX4 Storm .177 Caliber Steel BB Airgun Pistol is well made and feels very natural in the hand. The balanced weight and smooth operation, while a bit lacking n the velocity department, allows a shooter to be right at home moving from firearms to practicing with a pellet pistol. A proven brand name with an excellent performance, the Benjamin Marauder PCP Air Pistol (.22) is a great hunting gun that has few peers at this or even higher price points. Why it’s recommended: 700 fps velocity is a staggeringly fast speed for .22 caliber projectiles, which makes this a perfect hunting gun for small game. 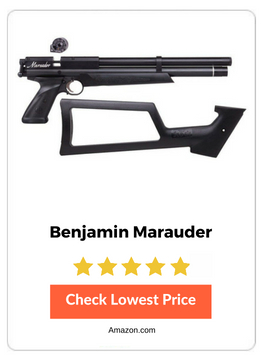 Despite being a bit loud and expensive, if you are serious about buying a quality pellet pistol, the Benjamin Marauder PCP Air Pistol (.22) is probably the starting point for the higher end guns, and easily beats anything close to it in price through powerful performance. 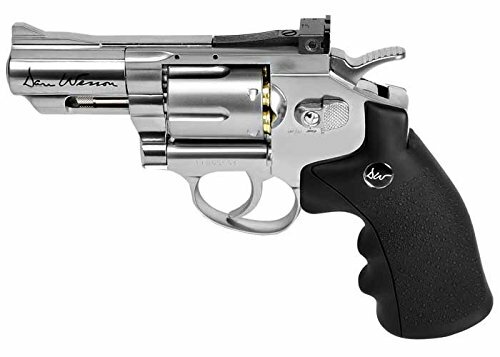 The Dan Wesson ASG 2.5″ CO2 Powered Air Revolver is a nicely made BB revolver, this is well made and hefty. It feels and looks a lot like what many would expect a revolver to be, despite being much lighter than its firearm counterpart. Shoots a .177 BB. Why it’s recommended: Well made and built to last, despite being made to a specific segment of the market, the Dan Wesson ASG 2.5″ CO2 Powered Air Revolver is still enough fun to justify the purchase. A gorgeous BB revolver for the money, the Duke SAA Colt Peacemaker CO2 BB Revolver is well built and made to last. The decent accuracy, mid-range velocity and build quality are excellent for the price point. 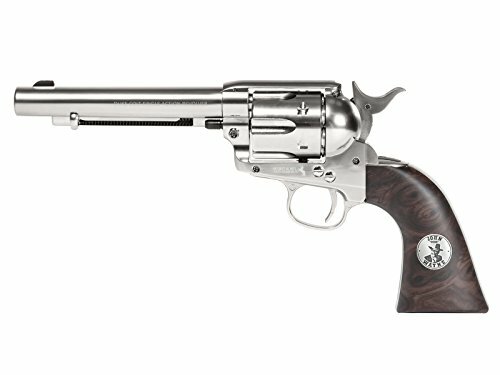 Why it’s recommended: Simple, and traditionalist design, the Duke SAA Colt Peacemaker CO2 BB Revolver is an excellent addition to aid in training or for new shooters. The well-balanced looks and feel of the gun contribute well to performance and credibility. The Colt Python air pistol is a great replication of a famous and beloved firearm. Made to last and offers a very competitive performance for a BB revolver. 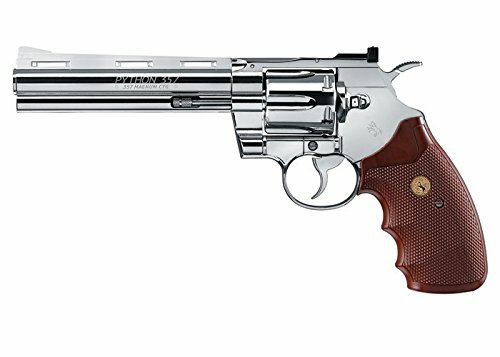 Why it’s recommended: For those who like The Walking Dead, this is a great replication of the Rick Grimes’ Colt Python, and offers excellent balance, good accuracy and durable build quality. Simple and built to function very similarly to the real-world firearm, this is a Smith & Wesson clone that is close. Please note that even though it is impressive to have a pellet pistol that is so closely related to the parent firearm, it can pose danger as people may identify with this being a real firearm because they don’t know any better. 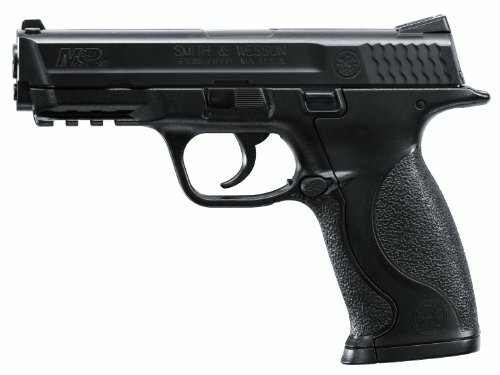 Why it’s recommended: The Smith & Wesson M&P Airgun (Medium) is a good price point for the relatively good accuracy and performance. 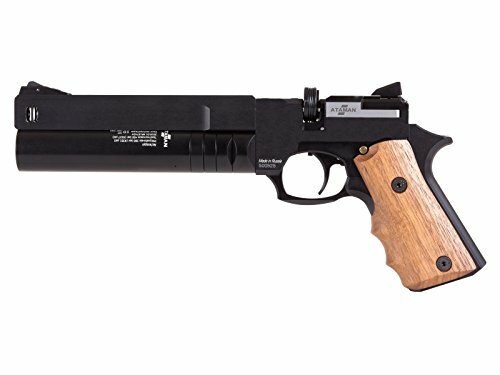 Why it’s recommended: The excellent build quality and accuracy makes the Alfa Competition PCP Pistol air pistol a great first serious gun for competition. A one year warranty and the perks of being one of the best looking air pistols on the market for the money. 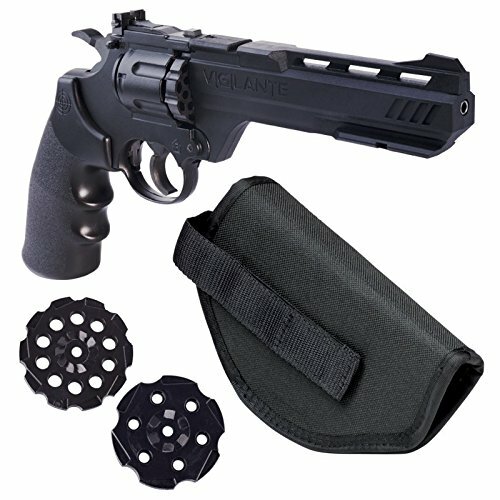 The Air Venturi V10 Match Air Pistol air pistol is a “pro-sumer” model of the target pellet pistol and may be the best air pistol for the money. Why it’s recommended: A top quality gun that is built to a level of production that few makers will try to match, and yet, still offers a very competitive price point. The Air Venturi V10 Match Air Pistol air pistol shoots accurately and is easy to use for most shooters. The Ataman AP16 Regulated Compact Air Pistol is built for true competitors that want something a bit more versatile and durable. The repeater pneumatic rechargeable reservoir offers some unique benefits. 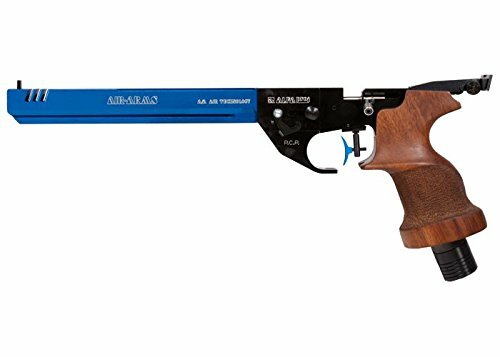 Why it’s recommended: If you are a competition shooter or want to be, the Ataman AP16 Regulated Compact Air Pistol offers some perks without being so competition tied by looks/design/functionality, that will serve your variable use case well. 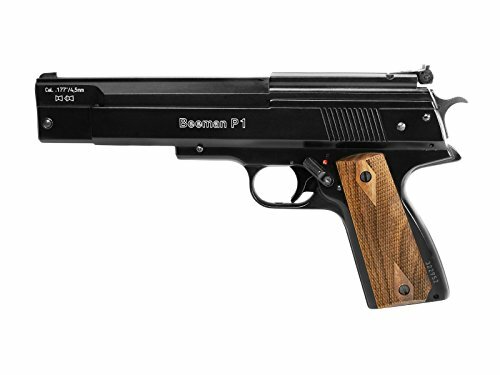 The Beeman P1 Air Pistol is a very capable gun that offers accuracy, balance, velocity and a superior build quality to most pellet pistols. This is acceptable for competitive shooting but better suited to more casual endeavors including small game backyard hunting and plinking. 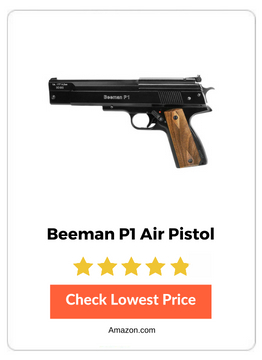 Why it’s recommended: Given the name, the quality and the versatility for all types of pellet pistol shooting, the Beeman P1 Air Pistol is the real deal for those that can justify the money spent. You can find various uses for today’s air pistols. The Best Air Pistols are going to be quite versatile and you can rest assured they will be more capable than any guns that came previously. The carryover between options for what you can do with a modern air pistol is pretty large. Hunting is an obvious choice but understand your limitations. This is not a very powerful gun. Even the best air pistols are still limited in their lethality and the velocities, energy transfer and distance parameters they operation within. When you are hunting, ask yourself: am I making a wise decision to try to dispatch (kill) this animal? Is it potentially going to leave the animal alive and wounded, or worse, alive and angry after I pull the trigger? Make sure you are taking responsible shots when hunting with a pellet pistol, BB gun or other substantially similar device. If you cannot reasonably kill an animal, or it is illegal to hunt that type of animal in your area, do not take the shot. Note: game laws in almost any jurisdiction are not favorable to ignorance. That is, quite simply: you can be found liable for actions you take, regardless of whether you claim to know or not. It is your “duty of care” to ensure you are well within the compliance of state, federal and local laws when using any kind of weapon. If you try to kill a deer with a .177 BB pistol, you can be fined, and imprisoned. Even though that premise seems utterly ridiculous. The fact is, your lack of understanding and more importantly, your decision NOT to make a good decision while “hunting” can result in fines, or imprisonment. Hunting makes sense with a pellet pistol or other similar weapon, when the game is very small, and where the range is close enough to ensure a clean kill. Some obvious targets would include squirrel, rabbit and small birds. It is up to you to understand the anatomy of the animal well enough to make a clean, humane kill on it, at a reasonable range. Generally, the range should be no further than 25-40 feet for most small game when you are utilizing a pellet pistol. A popular choice – all you need is a piece of paper, a backstop and some pellets to have hours and hours of fun and strategic experience building shooting opportunities. You can even step up your game by buying a pellet trap and unique targets or staging a legitimate range setup on your property. This is a top choice for pellet pistol buyers as far as how they will spend their time using their guns. Some of the pistols on this list are incredibly high-end pistols, made specifically for competition. You can do this in your local area, and while you wont NEED a top tier pellet pistol, the best air pistol will give you a distinct advantage in many ways. Sanctioned matches can be found by networking though local shooters and utilizing internet searches and by joining the local shooting club for the pellet/air gun enthusiast clubs in your area. Generally, this means shooting at objects in the ambient environment, and specifically the terminology refers to the sound made when shooting a bullet at an old tin can. This is a favorite pastime of many pellet pistol users. Given the relative low cost of the pellets and the guns, this is hardly a waste of money, and can be quite fun. It’s all fun and games until someone puts out an eye, or someone gets killed. Safety is a serious topic when it comes to firearms/guns of all types, including the humble pellet pistol. It couldn’t be truer nowadays. The higher velocities and performance improvements make these guns too dangerous to not take safety seriously. Pellet guns can and do have frequent ricochets, especially when used by those who are not experienced shooters. Be careful to only shoot at an object/target that will not pose a risk of deflection or ricochet. There is another side to this topic though, and it is a very real concern. These guns almost ALWAYS resemble a legitimate, mass produced firearm of some sort. That means if you are playing around with one and someone believes it is a real gun, then “it is”. They can call law enforcement on you, which could lead to some sketchy encounters with officers, and anything could go wrong when someone thinks you might have a gun on you. Read below for some insight on how to engage in these types of scenarios. NEVER try to favor being right over being safe. Your ego is not as precious as your life. Even if you feel targeted by neighbors of cops or unfairly encountered while having an air gun on you, don’t let a poor judgment call on your behalf, cause a more serious incident, injury or a death. Be smart as you interact and think things through before you take actions. Communicate as you are thinking things through so those involved can get a clear picture of what is happening and are not making hasty, emotional decisions as well that might harm you. Never wield any air gun like it is a real firearm. People could think you are threatening them and they could act in a way that could cost you your life. That is doubly important as a warning never to threaten anyone with a weapon even if you intend to use it; even then don’t bring a pellet gun to a real gun fight. Never keep the air gun concealed from a law enforcement officer. Early and specific notification to that officer that you have an air gun and asking the officer how they would prefer that you proceed in removing the weapon from your person is important. NEVER take a gun out of a pocket, holster or even move towards your gun, real or air powered, until you are told to do so by the law enforcement professional. Let them instruct you how they would like to see the gun repositioned. The best thing to do is to show your hands in a safe and unthreatening manner and to calmly move, without making sudden movements. Asking permission before you move your hands can also be a smart thing to do. Do not point a gun at any object you do not intend to shoot – even if you intend to shoot it, it’s important to maintain basic safety protocols. Never carry a gun concealed for the purpose of resembling a concealed carrier. Never overestimate the potential of your gun or underestimate the opportunity for people to misinterpret a given situation. Be the “smart” and the “courteous” variable in any equation involving outside parties and your gun, regardless of the type of gun it is; this includes air pistols, pellet guns, BB guns and other variations. If there is some concern brought to your attention, do not be afraid to communicate and be as transparent as possible to avoid potential escalated concerns. Generally, utilize safe gun protocols and try to maintain a level of safety that will make the most unexperienced users comfortable as well. Be careful what you’re aiming at, pellet guns can have their pellets deflected easily if they strike a hard surface. This can lead to ricochets and dangerous flying objects at high rates of speed. Be careful to secure the air gun as you hike; run or move so you don’t have accidental discharge of a pellet. You should observe safe travel as well, ideally discharging the pellet in the chamber before moving forward, or securing it with an adequate safety. Wear appropriate safety equipment, including safety glasses, and preferably those products with recognized safety ratings/certifications. Observe safe hunting protocols, know what’s behind the thing you are shooting at; don’t try to kill an animal that cannot reasonably be killed by the single pellet in the gun at the time you pull the trigger. Keep your air gun in good working order and implement a good routine maintenance program to keep in top shape. Never alter any air gun or “mod” it to “improve performance” if you can help it. Try to keep the horseplay and joking to a minimum and establish clear lines of communication with other shooters who will be accompanying you to ensure that you are all on the same page, and that you understand what phrases and key words exist that will tell the group what is happening. There are so many legitimate reasons to carry a pellet pistol, not one of them is for self-protection or the illusion of self-protection. The best air pistol in the world will be useless if you don’t like it, can’t shoot accurately with it, or don’t treat it with the respect any weapon deserves. What is of high importance is the quality with which it is made, your attitude towards the pellet pistol, and the way you use the gun. Most other variables become too lost in the ubiquity that is the landscape of the modern, inexpensive pellet pistol market. What you need to do, is find one that’s interesting to you; and, get out there and use it to become familiar with the sporting uses of the pistol. When you understand what your gun can do, your experience grows, your enjoyment grows, and your money begins to become well spent, as it is more an investment in your time an energy than it ever was a simple monetary transaction to buy a pellet pistol. In the end you want to know that the commitment you have made is more than just finding the most expensive gun you can buy or having to rely on a less expensive model because of budgetary restrictions. It’s about whether your time was well spent and whether you can derive enjoyment out of the resulting efforts you have made. We are looking forward to hearing about your journey into finding the best pellet pistol for you. There are many different uses for the best pellet pistol so be sure to read through the reviews to find the right one for your needs.